and we do it better, faster, and more affordable than most. Our commitment to our customers is to bring new equipment, technology and years of craftsmanship together to make their project a piece that makes everyone proud. 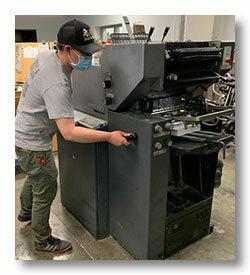 We produce high quality products on traditional Offset Commercial Presses, state-of-the-art High Speed Digital Presses, and old school elegance of the letterpress. To get started with your Printing project, give us a call today at (888) 282-8764. You can also Request a Quote or go to our Print OnDemand online catalog. The workhorses of our printing department, our offset presses get the job done. Period. From newsletters to brochures to foiled business cards, we've got you covered. Our high speed color and black & white digital presses deliver fast turn-arounds and variable data capabilities, without sacraficing the quality of traditional offset printing..
For yourself and your business, being recognized is the goal. Web, social media, and direct mail can tell everyone what you do, but foiling and embossing tells them who you are. A wise company invests in itself and recognizes the value that sophistication brings to their brand. That's what adding a classic effect to your business stationary or marketing collateral will do for you. Let us help. We have designs, methods and equipment to help you stand above the rest. Give us a call or fill out our form. We can talk about your goals, and give you a free quote and consultation about how adding premium effects can positively impact your brand's image. API-Marketing has been foil stamping and embossing for over 30 years, and we are considered master craftsman in producing elegant print. Foil stamping is a great way to elevate a design that calls for a polished look. Metallic foil accents and logos are immediately eye-catching and create a sense of distinction. When your business card, invitation, booklet, logo, thank you, or holiday card design needs added charisma, you have choices. Foiling in hundreds of colors, embossing, debossing, blind embossing, sculpture embossing, or print embossing. Many of these can even be used along with digital printing. Unlike many printers, we maintain our own finishing and bindery services in-house. Our finishing equipment is complementary to our presses and this gives us several advantages that affect your bottom line. We can maintain tighter control over scheduling and need fewer extras to provide an accurate final count. Whether foiled stationery package or a 68-page full color publication, you can rely on APi-marketing.